In the era of application supremacy, every organization promotes its brand, products and services via web and mobile application. Modern software delivery practices change the game for what’s possible and how teams can go from an idea to realization. With the shift to faster release cycle times, whether you are far along in the journey and already ship code multiple times a day or contemplating with a goal of shipping more often than once per quarter, there is consensus that testing must “shift left” to earlier in the software delivery lifecycle. Organizations are embracing Agile development methodologies coupled with DevOps practices in minimizing software delivery bottlenecks by relying on small agile teams that develop code, conduct unit, functional, integration, load & performance tests. These teams prefer open-source tools that can be accessed from native integrated development environments(IDE), building test scenarios in a language of their choice and run small scale test for instant feedback with integration into CI servers. They strive to constantly experiment with the code to deliver on business objectives. However, performing massive–scale load tests were previously possible only with elaborate upfront planning by engaging specialized teams, with restrictive licensing schemes and provisioning expensive testing environments, thus essentially creating testing bottlenecks. Relying on a testing approach that is grossly inadequate and hard to analyze the results holistically, may put web or mobile apps at risk and may miss identifying the actual problem. The move to agile development methodology, adoption of DevOps and API proliferation are forcing a change in how testing is traditionally done in organizations. Conducting performance testing quickly, securely and accurately either with-in the firewall, outside the firewall or both, has become extremely important in today’s application economy. Many organizations can have requirements on how, what and where synthetic load test data can be generated from. Others can have regulatory mandates on the type of test information / data for applications on where they are stored and how they are transmitted across firewalls even when they secured and encrypted. CA BlazeMeter platform will let enterprises simulate massive virtual user traffic, whether it is 2 or 2 million concurrent users. Its architecture stages and manages all the infrastructure required to orchestrate the load test, gather and format the test results in rich reports and interactive graphs. With support from 38 locations across the globe (Asia Pacific, Europe, North and South America), organizations can choose from cloud provider of their choice such as AWS, Google or Azure. Whitelisting / Dedicated IPs: Some organizations have security policies to block incoming traffic into their servers or datacenters from outside the network firewall. If this happens to be the case, work with organization network security team to allow load request from certain IPs or IP list (range), also called whitelisting. 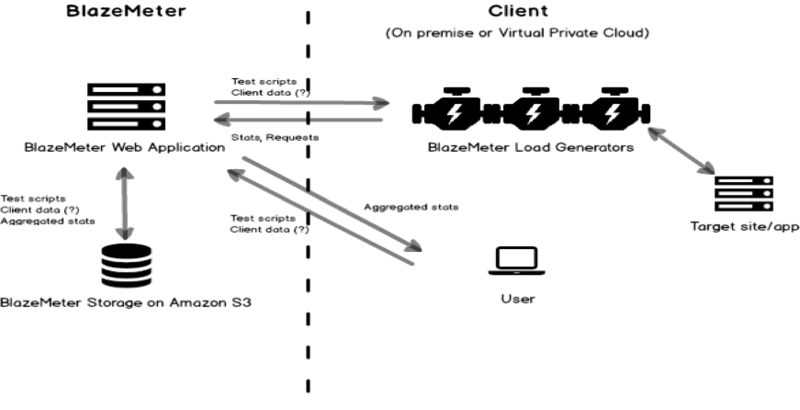 Optionally, BlazeMeter IP addresses can be made available on demand or dedicated IP's can be purchased to configure corporate server(s) to accept traffic. In some instances, organizations have strict guidelines and have a need to test within their private network or in their own private cloud. 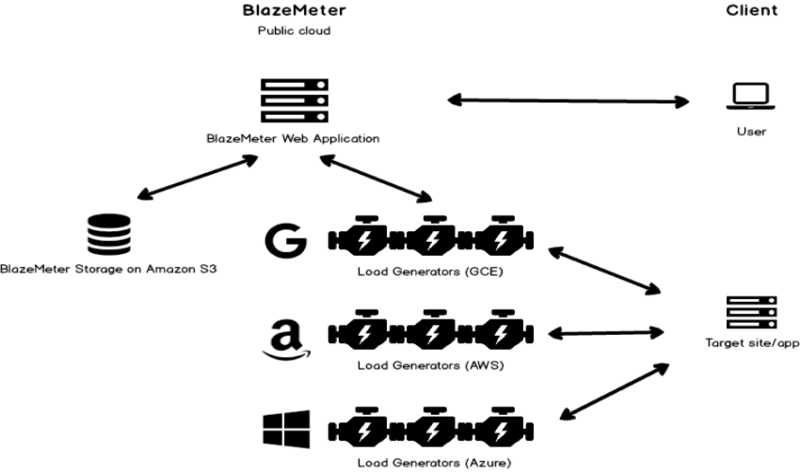 With CA BlazeMeter, organizations can drive virtual traffic from behind their own firewall with BlazeMeter's dockerized private agents. Agents are easy to install and enables teams to test their applications for performance, continuously from development to production. There is an ultimate combination where organizations can have flexibility of SaaS while keeping their data on premise with hybrid option. In this, sensitive data, like user’s information, endpoints and business data, is kept behind the firewall. Non-sensitive data, such as statistics on latency and response time, is uploaded to the cloud with hashed labels for number crunching, big data calculations for anonymized reporting. Absolute privacy is maintained as data, such as test scripts and logs, never leaves the internal network. Testing is a process, not an event. Ongoing performance, security and load testing are essential, particularly for those businesses that frequently change their websites or update applications. Implementing a plan to conduct regular testing to ensure that systems remain functional, robust and secure for a long time to come is crucial for business success.